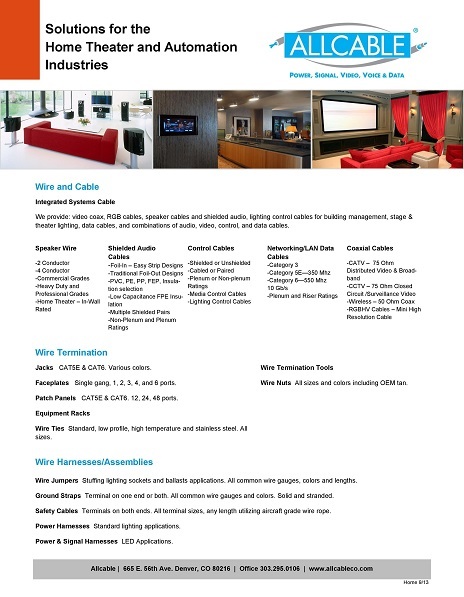 Allcable has all of the wiring and ‘behind-the-scenes’ necessities for home theater and home networking jobs, from the cable to network the entire house, to speaker wire, to power harnesses and data cables. Integrated Systems Cable: Video Coax, RGB cables, Speaker Cables, Shielded Audio, Lighting Control Cables for Building Management, Stage & Theater Lighting, Data Cables, and Combinations of Audio, Video, Control, and Data Cables. Coaxial Cables: CATV – 75Ohm Distributed Video & Broadband, CCTV – 75 Ohm Closed Circuit/Surveillance Video, Wireless – 50 Ohm Coax, RBGHV Cables – Mini High Resolution Cable. Click on the image above to donate to Allcable's DCAC fundraiser!